Today Wyoming County has one local newspaper, the New Age Examiner [Update: Wyoming County Press Examiner in 2016]. Going through the old newspapers from the Metcalf collection (purchased and returned from NY State in 1981) we find the following papers were at one time published in our county. Wyoming Patrol and Republican Standard – 14 Jun 1843 thru 14 Feb 1849, published by William Bolton. In the 8 Apr 1849 issue, it states S. S. Winchester has bought the establishment of Wm. Bolton and changed the name of the paper to “Wyoming Co. Democrat”. North Branch Democrat – 15 Feb 1854 thru 12 Mar 1856, published by D. A. Yarrington and J. V. Smith; 19 Mar 1856 thru 3 Mar 1858, published by A. R. Conklin and F. G. Osterhout; 10 Mar 1858 thru 26 Dec 1860, published by Alvan and John Day; Gap between Dec 1860 and Aug 1861; 14 Aug 1861 thru Aug 1867, published by Harvey Sickler who changed the name to “Wyoming Democrat” for the 7 Aug 1867 issue. 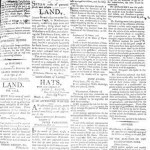 Wyoming Democrat – 7 Aug 1867 thru 26 Jul 1871, published by Harvey Sickler; 2 Aug 1871 thru Jul 1907, published by Alvin and his son, James Day. Wyoming Republican – 8 Feb 1860 thru 13 Feb 1861, published by S. LeRoy Tiffancy; 20 Feb 1861 thru 15 Mar 1865, published by William Burgess; 22 Mar 1865 thru 17 Oct 1867, published by Ira Avery and later by A. F. Yost. Tunkhannock Republican – Col. Perry Marcy began publication of the paper on 1 Aug 1869, mainly to advocate the cause of Temperance, education and Republican principals. Editor was Albert F. Yost. Mr. Yost had come to Tunkhannock circa 1866 to start a newspaper in the office of the defunct “Wyoming Republican.” In 1873, Yost and Judson Furman leased the “Tunkhannock Republican” from Col. Marcy and ran it until Furman left in fall of 1875. Col. Marcy took over the paper again with Miss S. E. Bower as editor. In 1876 he sold out to Cyrus D. Camp and he later sold it to George Lyman Brothers “New Age” in Feb 1904. New Age – The “New Age” began publication in 1882, however, little is known about those first years. In 1886 it was bought by Victor Lyman and George Young. In 1887 Berkley Lyman bought out Young and Lyman Bros. was born. In 1876 Berkley and Ellen Atkinson were married and in 1881 brother Victor married Ellen’s sister, Lucinda. The Lymans worked together to keep the paper going. In 1892 Frank Hefferan, aged 16, came to work for the “New Age.” He worked without vacations for 65 years, even hating to take holidays off. He was killed while crossing the street in Tunkhannock on 26 Apr 1957, aged 82 years. Lucinda Lyman died in 1902 and the other three Lymans carried on and expanded the business. In Feb 1904 they purchased the “Tunkhannock Republican” from Geo. Baldwin and on the 18th of that month the first “Tunkhannock Republican and New Age” came off the press. The New Age Examiner – First issue 11 Jan 1979 to present. Laceyville Messenger – first linotype in county used here by Jan 1937 the machine was being used in “Tunkhannock Republican” office. Nicholson Record – published was Moses Shields Jr., and after the fire in 1904 that destroyed the Examiner office. Noxen Vandette – this newspaper was short-lived. Factoryville tried two papers, both were also short-lived. Copyright © 2014 Wyoming County Historical Society. All rights reserved.